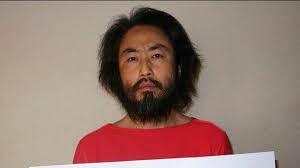 A fresh image of Japanese journalist missing in Syria last year has been published online. In this picture the journalist and he has grown a beard, holding a placard, on which is written ‘, it is the last chance.’one year ago, missing Japanese journalist Jumpei Yasuda freshly published a picture of Syria has been widely reported in the local media. In this picture the journalist dressed in orange and has his head and beard grow.